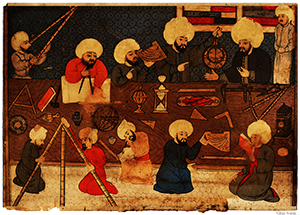 A Madrasa Discourses Panel: "Science and Religion as Partners in Peace?" This panel explores the relationship between science, religion, and peace. Our accelerating ability to manipulate the natural world, and ourselves, gives us tremendous power. But do we know how to responsibly wield that power? Religion can be a guide, but it can also be a menace. Can science give us peace if it is itself value neutral? Can religion give us peace if it is out of touch with new realities that science is unveiling for us? Participating online will be faculty and students in the Madrasa Discourses program in India and Pakistan.